The extraordinary protests that followed Russia’s December 4 parliamentary elections continue to resound. Still more extraordinarily, the Kremlin refrained from using armed force to put down the massive demonstrations that took place across the country, a week after the disputed vote. And yet no one can say whether these events are signs of deeper change. In the run-up to the balloting, former Soviet president Mikhail Gorbachev emphasized the challenges facing Russia when he publicly accused the Kremlin of reverting to its old authoritarian habits and predicted that the contest would be rigged (charges that the government quickly denied). 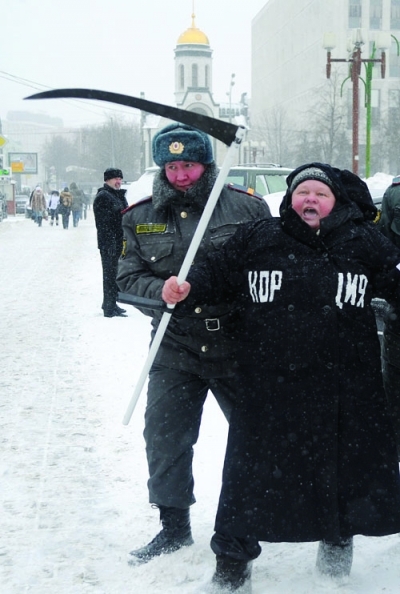 Its long and brutal past remains very much a living force in present-day Russia. The ruling elites are the products of centuries of history, of personal and collective ordeals, of indoctrination, and of the psychological ability to survive those ordeals and accept that indoctrination. Chekhov wrote of Russia’s “heavy, chilling history, savagery, bureaucracy, poverty and ignorance.” As he put it elsewhere, “Russian life weighs upon a Russian like a thousand-ton rock.” At the time, he was looking back on centuries of extreme despotism. But in the century that followed his verdict, the country went through much that was even worse. Czarism may have been the most repressive regime of its time in Europe, but Lenin’s Soviet Union was far more violently repressive than anything the continent had seen in centuries—never mind the greater horrors that followed Lenin’s death. It can hardly be maintained that Russian communism was merely a continuation of what came before. At the same time the politico-economic apparatus solidified into a new caste. The central, classical demonstration of what might be called ideological insanity in practice came with the campaign in 1929–33 to collectivize the peasantry. Lenin misused the term “kulak,” signifying a newly prosperous peasant, to wage class warfare and seize the holdings of small landowners. Millions of human beings perished, and the agricultural economy was wrecked. A long and brutal past remains a living force in present-day Russia. After the disaster of collectivization, the leadership had two options: either to admit failure and change policy—perhaps even to relinquish total power—or to pretend that success had been achieved. Falsification took place on a barely credible scale, in every sphere. Real facts, honest statistics, disappeared. History, especially that of the Communist Party, was rewritten. Unpersons vanished from the official record. A spurious past and a fictitious present were imposed on the captive minds of the Soviet people. Until Gorbachev came to power, the country lived a double existence—an official world of fantasy, grand achievements, wonderful statistics, liberty, democracy, all juxtaposed with a reality of gloom, suffering, terror, denunciation, and apparatchik degeneration. The confrontation with the West was a natural product of the Soviet order’s mental distortions. The prevailing mindset required an unceasing struggle with competing cultures, and spawned what Gorbachev would later describe in his farewell address as an “insane militarization,” which ruined the country. Another notable characteristic of the Soviet system was the fact that though the state was in most ways far more powerful and intrusive than that of, for example, the United States, laws inconvenient to anyone with pull were simply not enforced. I learned that something in Moscow had radically changed when I first met Gorbachev. The Soviet leader was on his 1990 visit to America, and we held a small seminar for him at Stanford. One of those present was a seismology professor, who asked Gorbachev about the devastating 1988 earthquake that had killed at least twenty-five thousand people in what was then the Armenian Soviet Socialist Republic. The seismologist noted that the Armenian event had been roughly the same intensity as the 1989 California quake that killed sixty-three. Was Armenia’s toll so much higher because its quake had hit ancient villages dating back long before modern earthquake-resistant building codes—unlike most of the structures in California? Lenin misused the “kulak,” a newly prosperous peasant, to wage class warfare and seize small landholdings. Milovan Djilas, the Yugoslavian former Communist who became one of the best-known critics of the system, noted in 1940 that the rule of Soviet leaders was “anchored in ideology, as the divine right of kings was in Christianity; and therefore their imperialism, too, has to be ideological or else it commands no legitimacy.” This, he added, was why Westerners were mistaken in hoping the Kremlin might be pressed or humored into a truly comprehensive détente: “No Soviet leader can do that without abdicating his title to leadership and jeopardizing the justification of Soviet rule”—which is precisely what finally happened. The decisive step was the launching of glasnost and perestroika in the late 1980s. Gorbachev and the brighter of his colleagues had seen that his predecessors’ policy of massive and continuous falsification was not only ruinous to morale, but also incompatible with economic success—and even that the prevention of free speech was stultifying the whole political and social order. When your inland seas begin to dry up—as the Aral Sea did under Soviet rule—it’s hard to stomach a government-issued fantasy of beaches and breakers. So as glasnost grew, the struggle to attain reality became ever more intense. Foreign radio broadcasts had already convinced many Russians that their country’s official truths were untenable, but when glasnost hit Russian state television, the effect was stunning. The televised debates in the Supreme Soviet, with Andrei Sakharov arguing with Mikhail Gorbachev and speaking out for democracy, disrupted production at factories all over the country, as workers clustered around the sets. Modern technology greatly encouraged the emergence of civic connections in place of the country’s previous social atomization. Groups hitherto isolated were now in continual touch. As crowds filled the streets in August 1991, during the hard-line Communists’ last-ditch effort to topple Gorbachev, fax machines helped keep communication open, and copies of declarations from the country’s farthest reaches, from Pskov to Vladivostok, were plastered all over the lampposts of Moscow and Leningrad. Russian politics was deprived of a rapid and painless modernization, partly because no trained political class existed. By then, glasnost had brought a huge mass of officially banned knowledge out of hiding. The destruction of the Stalinist myth (and eventually of the Leninist one) had come not in single refutation, but in a massive, continual hammering in of the facts over months and years. This is how mental climates are changed. The first public mention in Russia of The Great Terror, my book on the Stalin era, was when Katrina vanden Heuvel interviewed me for the weekly Moskovski Novosti in the spring of 1989. When I finally arrived in Moscow later that year, it was everywhere. In the preceding decade there had been little reply to the book from the Communist Party, even though copies had been printed for Politburo members. But now, at the final plenum of the Communist Party’s Central Committee, the Stalinist writer Aleksandr Chakovsky denounced me as “anti-Sovietchik number one.” Too late: the Russian edition was already being serialized in the literary monthly Neva, a million copies per issue. The primary reasons for the need for perestroika were not the sluggish economy and the rate of technological development but an underlying mass alienation of working people from significant social goals and values. This social alienation is rooted in the economic system formed in the 1930s, which made state property, run by a vast bureaucratic apparatus, the dominant form of ownership.… For fifty years it was said that this was public property and belonged to everyone, but no way was ever found to make workers feel they were the co-owners and masters of the factories, farms, and enterprises. They felt themselves to be cogs in a gigantic machine. By then, the Soviet Union had become a vast kleptocracy. As Alain Besançon noted, money—in addition to the long-standing perquisites of power—had begun to play a major role, foreshadowing (as he put it), a sort of “savage capitalism.” The already large criminal element had, in fact, become almost institutionally intertwined with the bureaucracy. There were—and continue to be—stunning illegalities. A deeply cynical caste has come into being, one which I consider dangerous (to itself as well as to all mankind)—a sick society ruled by two principles: blat [a little slang word meaning “you scratch my back and I’ll scratch yours”], and the popular saw: “No use banging your head against the wall.” But beneath the petrified surface of our society exist cruelty on a mass scale, lawlessness, the absence of civil rights protecting the average man against the authorities, and the latter’s total unaccountability toward their own people or the whole world. The Soviet bureaucracy’s reaction to the 1986 Chernobyl disaster is illustrative. As David Remnick later noted in the New Yorker, it was typical of the regime that plant director Viktor Bryukhanov, on being told that the reactor’s radiation was millions of times higher than normal, replied that the meter was obviously defective and must be thrown away. Deputy Prime Minister Boris Shcherbina rejected a suggestion to order a mass evacuation. “Panic is worse than radiation,” he said. Gorbachev and his allies were able to see that the system was unworkable. But they faced powerful opposition. When “conservative” elements within the Politburo launched a military coup to remove him, Boris Yeltsin, at this point holding the largely decorative position of President of Russian Soviet Federative Socialist Republic—supported by one hundred thousand Muscovites who formed a human barrier around the Russian White House—was instrumental in spiking the conspirators’ revolt. But a few months later, Yeltsin, together with the presidents of the leaders of Belarus and Ukraine, signed treaties abolishing the USSR, creating in its stead the Commonwealth of Independent States (CIS)—while leaving the presidents of those republics in power. In fall 1993 came Yeltsin’s crushing of his rebellious Communist opponents in parliament resisting his “privatization” legislation, sending in tanks to shell the same White House he had defended in 1991. The referendum that followed in December ushered in a constitution granting the president extraordinary powers (which has abetted Vladimir Putin’s rule), along with unfettered plundering of state property, now privatized. And with it came the rigging of elections and control of the once-free press. After nine years Yeltsin—the first legitimately elected leader of Russia—became the first Russian leader to relinquish power voluntarily, handing over the presidency, with its vast powers, to Putin. The present regime may have abandoned the compulsive economic ideologies of the Communist past, but it has not developed anything like an open society. And yet the case for freedom is about far more than abstract morality. It’s a practical matter, as the communist heroine and martyr Rosa Luxemburg explained in 1918 when she argued against Lenin’s suppression of hostile opinion, and against the closed society: “Without general elections, without unrestricted freedom of press and assembly, without a free struggle of opinion, life dies out in every public institution, becomes a mere semblance of life, in which only the bureaucracy remains as the active element. . . . [S]uch conditions must inevitably cause a brutalization of public life.” Subsequent decades proved how right she was. Russians are used to electoral fraud. There were never any expectations that the December 4 parlimentary elections would be carried out with complete honesty, any more than Russia’s past votes were. But this time, instances of ballot irregularity were recorded by mobile devices and then posted on the Internet, to which more than 40 percent of Russians now have access. Outrage—and calls to protest—flashed from computer to computer. Political discourse is thriving in blogs, tweets, posts to Facebook, uploads to YouTube—challenging the regime’s old-media monopoly on news and opinion. One can have “reform” without liberalism, and Russia’s regime remains far from the rule of law—something even more important than “democracy.” The Russian bureaucracy has not abandoned its habit of failing to fulfill its contracts and obligations, and when we speak of the rule of law, we mean contract law as well. Russians remain justifiably skeptical about the political process. The problem is not primarily economic or even political. It is a certain lack of much feeling for community in the sense of a civic or plural order. That may be changing among the young, educated class. Yet Putin has reverted to the Soviet habit of blaming unrest on outside agitators, suggesting that “American partners” are manipulating the protesters. The question, especially from the West’s point of view, is whether Russia will descend into expansionist chauvinism. Even if it were not of the global, absolutist type that was typical of the USSR, that would still be an unwelcome development. Still, the world coped with a much worse Russia. Let us be optimistic. Reprinted by permission of Newsweek. © 2011 The Newsweek/Daily Beast Company LLC. All rights reserved.